Here’s to hoping this is just the short-term “after” photo…. I went to Dr. Laser All the Bad Away’s office with shaky hands and an open mind. Without makeup, prior to the procedure. 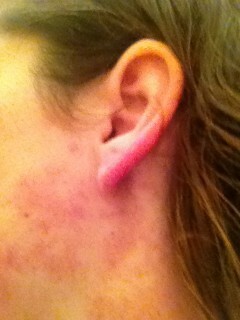 Note the rosy cheeks…..Spider veins. Where are you comin’ from. Spider veins. I don’t even know what you are. I would visit with 3 lasers: Yag, V-Beam and KTP, (though I don’t know which one was used for which area). 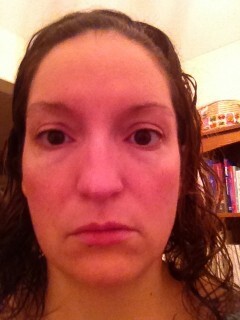 Laser 1: Getting rid of the eye veins. I had thick plastic Band-Aid-y shields stuck on my eyes. After successfully testing a spot behind my ear, Dr. Lasers pulled my eye veiny skin down toward bone, and zapped. Then he hesitated. Apparently he saw a spark. That’s not supposed to happen. Off to a great start, my doubting and fearful voice said. He cleaned the surface a second time with alcohol and tried again. I think he ended up turning down the laser because he was worried about making my skin blister. I think, however, what happened was that some of the previous day’s make-up remained, and since it’s mineral-based it caused problems? I don’t know. I breathed. The metal shield, to which I referred in Part 1 as a “shiv”, was a small tool with an end that looked like part of a shoehorn. It was put directly on my eyeball and held by the assistant as the vein was zapped around it. Each laser zap felt like a wet sting that ended with a burning sensation. Apparently a cooling liquid touched my face split seconds before the blast of super hot light scared the veins away beneath my skin. Then another cooling liquid followed in another split second. The first zap felt weird; the second kind of ouchy/burn-y, and once all the eye vein zapping was done I felt like someone had snapped a wet rubber band all around the bottom of my eyes about 30+ times. They let me look in a mirror and I have to say, I was pleased…the veins seemed gone, and there was no bruising, and only mild swelling. While I was relieved it was over (who likes anyone messing with their eyes? ), I felt pleased and I was happy with the care and caution Dr. Lasers seemed to use. He took his time and quietly concentrated. While my port wine stain (“ZinSplash”) is less noticeable than many others I’ve seen online, I wanted it removed because of the complications that may arise as I age (such as spontaneous bleeding following minor trauma; see Vascular Birthmarks Foundation. Dr. Lasers put me in goggles, tested this laser behind my ear again, and then went to town on ZinSplash. I’ve heard that the placement of tattoos has a big impact on the pain associated with getting inked, and now I may understand. 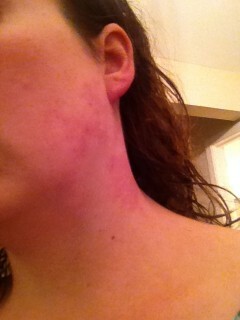 Parts of my neck only stung a little, others were very painful, like getting a skinned knee on my neck repetitively. That sounds ridiculous, I know, because one skinned knee is no biggie. But try like 100 skinned knees, peeps. You would cry like a tot. 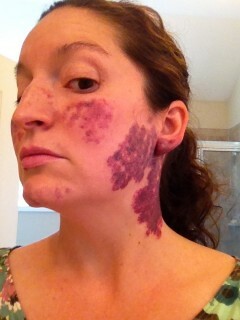 The sheer size of my birthmark meant a crazy number of zaps, and probably halfway through I told Dr. Lasers, “I need a break, to breathe.” The other oogy thing was that my birthmark covers the front and back of my earlobe, so at certain points the echoing volume of the laser near my ear canal was really weirding me out. I tried to go to my happy place. I don’t even know where my happy place is anymore. It may have been ravaged by tornadoes or something. Stupid climate change. When it was done, I felt a little worn out. Dr. Lasers went straight to Laser 3. Did I mention that while using this laser he was trying to carry a conversation with me? About travel? Dentists are not alone in their desperate need for social interaction while on the job. I think Laser 3 was actually just Laser 2 with its energy turned down, but I couldn’t be sure. This laser set about erasing the ruddy spider veins from my cheeks. [Important side note: these never bothered me a ton. I’d started covering them up with make-up, just to even out skin tone, but in a way I’d thought they were kind of a natural cure for the wan color of my face. Removing these was the one action for which I signed up that inflicted me with a guilty sense of vanity and greed]. The treatment started out okay, but the closer to the bridge of my nose the laser got, the more it hurt (hello, bone!). By the end of this procedure I was fairly miserable and had to slowly unclench and relax every single muscle in my body. When the goggles were removed, I was surprised that I needed to ask the assistant for a tissue to wipe away a couple of tears that had welled up. I was handed the mirror. I gasped loudly. I’m not dramatic. I don’t gasp often. 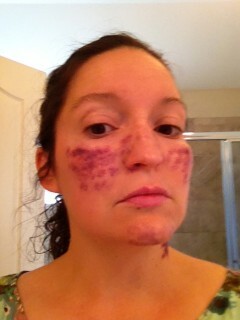 Had there been THAT many spider veins on my cheeks?? I was given ice. I was led to empty areas, either to avoid scaring away other patients, or to save my pride. I was thankful. I paid for my portion of the appointment, and made my next appointment, still in shock. “Can I wear contacts now? Makeup?” I asked the woman who handles laser questions and payments. I slithered out of the office; looked at my reflection in my car a moment, tried to be strong inside, and took back roads home to avoid eye contact with strangers (and consequently major traffic incidents). I felt like a vampire when the sun hit my lasered spots, particularly my neck. I wanted to shy from the sun because I felt like I’d gotten sunburn on Mars. I was told to ice 10 minutes at a time, but given the size of my “bruises”, this would mean icing all stinkin’ day, which I was not prepared to do. I did my best, but slowly my cheeks swelled so much that they looked like the female creature from Avatar. Bloody hell that sounds pretty grim! Well done. It looks dramatic (we love dramatic) and I would be compelled to say if anyone is curious (ie children) that on my last mission to Mars I got caught by a solar flare when I was outside mending the space ship. I can’t wait to hear the rest of the story. You’re amazing. Thanks, Gill! I’ve mostly just been in hiding so as not to answer questions about how it looks! I will be so excited when it goes away. Ouch! You are a brave soul for doing this and for going through with #3 after #2 hurt so much. I’m sure you will look amazing as it heals and 3 months from now if you didn’t read your own blog, you’d be saying that it wasn’t so bad. Time seems to lessen our recollection of severe pain. Or we’d never be stupid enough to have more than one kid. Keep us posted! Yes, I agree, in a few months I won’t even care much. That’s exactly why I posted this, though–a friend was nudging me to do so, so that if anyone else chooses these procedures and reads this, at least they know what to expect, and to avoid scheduling any photo sessions in any close timeframe, etc. I should have asked if the doctor had any before and right-after and way-after photos! You’ve done a great service. It is important to know the truth about what to expect. The doctors always gloss it over. This has to be possibly my favorite post. I am mesmerized by your courage Emily! I immediately started biting my nails when you mentioned the eye cover thingy. OMG! I would have been OUT of there right there and then. They’d have to sedate me! – They actually do have to sedate me when I go to the dentist. For real. Hugs, Grace! Yeah, I don’t know, it just sort of built and built until after the last treatment I wanted to go running out of there. It was more the cumulative effect of everything in one day. If there had been a 4th procedure I think I would’ve rescheduled/cancelled. Can’t wait to see you again too! Yikes! You’re a lot braver than me! I would’ve wimped out after session 2. Well done for sticking with it though, and I’m sure it will all look amazing once you’ve healed. I’d have a quiet word with the doctor at some point though about his definition for “some bruising”..!